Carrying things on your head seems like the natural thing to do in India. The fruit seller walks through the neighbour with a big bag on his head yelling “Mosambi!”. At railway stations, red-shirted porters easily negotiate the crowds while balancing several bags piled on top of their heads. In villages, straight-backed women with colourful water pots tottering on their heads make their way home from the well. Then there are the numerous city construction sites where you can see women effortlessly carrying plateloads of cement on their heads. Recently I was reading about Bangalore’s city market area in the paper. There was an interesting feature on ‘carriers’ or ‘runners’ who ‘run for a living’, carrying huge bags of fruits and vegetables. There are about 400 men who make a living in this way at the wholesale fruit and vegetable market. The article featured Muniswamy, a ‘runner’ from Tamil Nadu. He gets up every day at 3am and heads to the wholesale market in Kalasipalyam. His job is to deliver huge sacks of fruits and vegetables to the nearby KR market. To do his job, he needs to use his head. 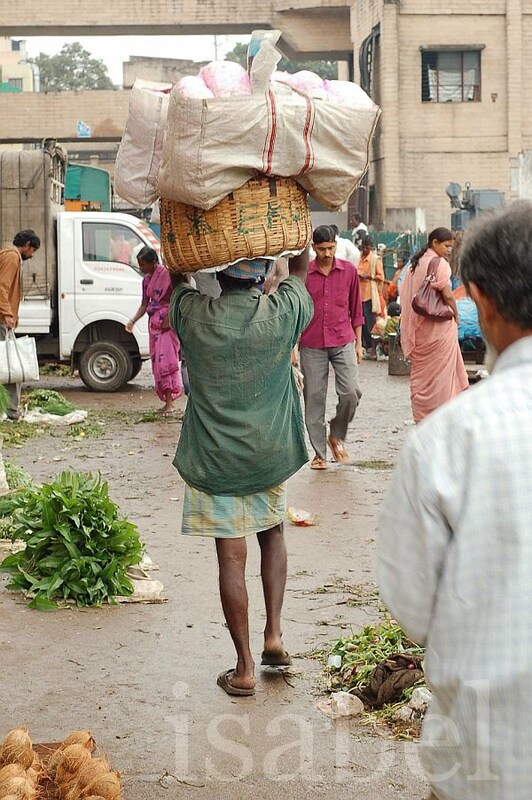 He carries loads weighing up to 60kg on his head, and sets off towards KR market at a quick, measured pace. He makes eight trips a day, taking short breaks in-between. Each trip takes him 15 minutes and he makes 20 rupees each way (0.35EUR/0.44CAD/0.43USD). The people who hire these human carriers say that they are cheaper than using trucks or auto-rickshaws and that this transportation method results in less damage to the fruits and vegetables. This seems like a tough job for someone who needs to use his head to make a living. In olden days,the postman used to be called "runner. "He would tie small ghungroos to his ankles and carry a spear in his hand and a bag of mails on his shoulders and run from one house to another to deliver the letters.This was because in places like Shimoga and other areas in Western Ghats,homes are scattered far and wide with fields in between,or up the hills.He would deliver the letter,read it to those who cannot read,and write replies becoz they could not write,and run back to the post office by sunset.I rem my grandfather telling me how the post office has become very modern.They use bicycles instead of runners now! !